From pram to pushchair, your little ones will enjoy all-day comfort with the stylish Maxi-Cosi Elea – either lying flat or sitting up in the seat which can face both parent and forward. Featuring 3 recline position in both direction, the Elea’s footrest moves simultaneously when the seat reclines to offer optimum support for your child. Supplied with a baby nest, this Maxi-Cosi pushchair is suitable from birth to 15 kg (approx. 3.5 years) and features a spacious padded seat unit and large puncture free tyres to ensure a comfortable and smooth ride when out and about. 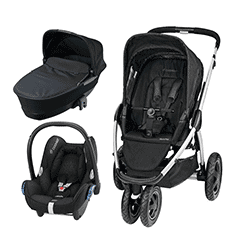 Thanks to its two folding options, the Maxi-Cosi Elea is very versatile. For a quick everyday fold, the Elea folds with the seat unit attached (dimensions: 60.5 (w) x 39.5 (h) x 88.5 (d) cm). As an easy storage option the seat unit can also be removed to have a more compact fold (dimensions: 38 (w) x 33 (h) x 84 (d) cm). Once folded the chassis locks automatically and stands upright. The pushchair chassis is also travel system-ready with adapter included. All you have to do is to clip on your Maxi-Cosi Pebble Plus, Pebble or CabrioFix baby car seat and you will be ready to go in second without waking up your little one when they are having a snooze in the car seat. Thanks to the Maxi-Cosi Foldable Carrycot, you can also transform you pushchair into a stylish pram. The Maxi-Cosi Foldable Carrycot converts your Maxi-Cosi pushchair into a pram for younger babies and allows you to transport your little one in lie-flat position, the optimum position for newborns. A few simple clicks are all it takes to attach it to the frame of your Maxi-Cosi pushchair. Thanks to its memory buttons and integrated carry handle, you can easily remove this carrycot from your pushchair with just one hand. Suitable from birth to 9 kg (approximately six months), it is recommend to use the Maxi-Cosi Foldable Carrycot only for children that cannot sit up unaided, roll over and are not able to push themselves up on their hands and knees. This carrycot features a double mattress and high sides to protect your baby from the elements and create the perfect sleeping space when out and about. Its extendable sun canopy provides additional protection on windy or sunny days. Ideal for parents with minimal storage space, the Maxi-Cosi Foldable Carrycot folds flat for tight spaces and is a is easy to transport. It comes with all the accessories you need when out and about: an extendable sun canopy, raincover, mosquito net and zipped on apron.